When you need precious positive photo memories to be kept from your wedding day choosing a top wedding photographer is a big decision. The question most brides ask is who can give me the best images of this very special day. After all the bride is going to be the celebrity for the day in her stunning outfit and make-up, all eyes are going to be on her and hubby-to-be. Thats when the search for good indian wedding photography websites or best wedding photographers begins. And just like when searching for the dream honeymoon destination the bride will search on Tripadvisor for reviews, the wedding photographer reviews should play a big part on who she picks to photograph her wedding day. This is where the Google reviews and Facebook reviews play a big part. These reviews will give an indication which photographers will give a 5 star service, not just in terms of the first-rate pictures but overall package which includes communication, keeping you updated, how quickly will the pictures be ready after the wedding, how long will the wedding album take. Before clients would recommended his services by word of mouth, now in 2018 you are able to read good, positive, testimonials of previous clients of his Indian wedding photographer reviews. Bipin feel a sense of achievement when the clients are happy and willing to recommend or leave a business review. Your wedding venue can be in India, Canada, USA, Dubai or The UK, the initial search for the best wedding photographers for prices, portfolio and reviews happens on Google. If no fantastic local photographers are to your liking give us a call. 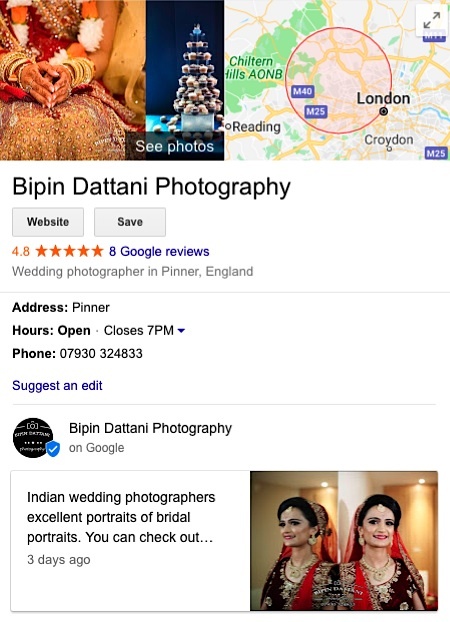 Bipin Dattani is specialists in Indian wedding photography and over the years has photographed many Hindu, Sikh, Tamil, Punjabi and Indian weddings across the UK and abroad in Marrekech & Mexico. We do offer destination weddings to India, Canada, Italy, Tenerife so why not call us with your quotation. Choosing a wedding photographer who can produce the top pictures is a big decision, can you afford to get it wrong!